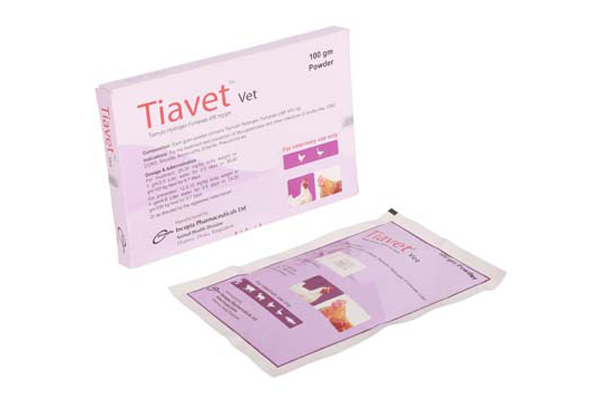 Tiavet Vet powder: Each gram powder contains Tiamulin Hydrogen Fumarate USP 450 mg.
Tiamulin is a broad spectrum antibiotic. It is specially used for prevention and treatment of Mycoplasmosis in poultry. Tiamulin inhibits bacterial protein synthesis by preventing chain formation of key enzymes and proteins. For the treatment & prevention of Mycoplasmosis and other infections of poultry like CRD, CCRD, Sinusitis, Airsacculitis, Enteritis, Pneumonia etc. For treatment: 25-30 mg/kg body weight or 1 gm/2 Liter water for 3-5 days or 30-40 gm/100 kg feed for 5-7 days. For prevention: 12.5-15 mg/kg body weight or 1 gm/4 Liter water for 3-7 days or 15-20 gm/100 kg feed for 3-5 days. Tiamulin is well tolerated for poultry at recommended dosage. However, reduction of water intake may be reported. Poutry should not be provided with feed containing Narasin, Monensin&Salinomycin during or for at least seven days before or after treatment with Tiamulin.